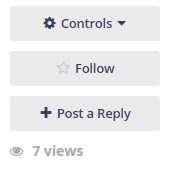 We need a plugin to display each "POST VIEWS" in front and can sort posts on homepage or in channel based on views. Well as of now views are seen like this. As for sorting conversations via views, that seems rather pointless, if it were views then you may have unwanted (Old) posts viewed and voted up because of people viewing them while new conversations being posted would be voted down because lack of views. We already have a working, stable plugin called views . To avoid changing core code, we can override the conversation.php file by duplicating it (with same folder structure) within views plugin folder. I'm attaching the modified views plugin here. You should be able to see the views on conversations as shown below. Whenever you search for conversations, you'll be able to see the views and even sort conversation by views :-) Hope this helps! · kthamma and [deleted] like this. Added 'settings' panel for admin where admin can choose to enable/disable showing view count on home page / search results. @Toby I've created a pull request. Can you please merge it with master if its ok? @chaos Added 'settings' panel for admin where admin can choose to enable/disable showing view count on home page / search results. I'm attaching the modified views plugin here. You should be able to see the views on conversations as shown below. Thanks for this! Although I have one question? If we already have views installed, do we unistall the previous views plugin and then install from the link you provided and no modifications needed?